The Health and Human Performance: Health Clinical Track is offered through the Division of Health and Human Performance in the College of Humanities and Social Sciences. Students will study clinical exercise physiology and behavior modification specific to clinical population groups with diseases, disorders, disabilities and special considerations, ultimately earning a Bachelor of Science in Health and Human Performance (health/clinical emphasis.) They will focus on safe and effective exercise prescriptions for individuals with cardiovascular diseases, cancer, diabetes, obesity and various musculoskeletal conditions and injuries. The purpose of the program is to examine how physical activity/inactivity, nutrition and lifestyle affect disease prevention/treatment and management of illness and/or disability. What makes an OBU Health and Human Performance: Health Clinical Track degree special? Our future health professionals exemplify Christian principles, approaches and practices. We integrate faith and science through study and research while focusing on the individual. Discussion-style lectures are supported with hands-on training in several exercise science and clinical laboratory courses. Practicum and internship experiences further develop knowledge, skills and abilities. Select students can participate in the Cancer Rehabilitation and Cancer Research Programs, where research and lab assistants obtain advanced learning and mentorship. The research team presents annually at an American College of Sports Medicine (ACSM) conference. What are OBU grads doing with their Health and Human Performance: Health Clinical Track degrees? 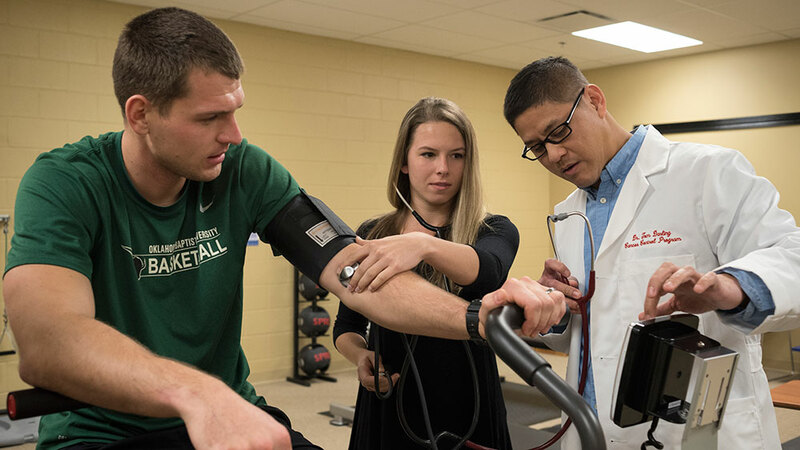 The majority of students pursue masters and doctoral degrees and clinical careers in Exercise Physiology, Physical/Occupational Therapy, Physician Assistant or Pre-Med. Many obtain professional certifications and specialty training. Some pursue academic and research careers. Learn more about our Health and Human Performance faculty.